The equity markets move up again – up over 20% in a couple of weeks. The real question of course is this a bear market rally or are we on the road to solid ground? I hope the latter but I still think is the former. The banking crisis is far from solved and the economy is still in deep trouble. Unemployment is off the charts and that is what they are counting. Consumer spending is still nose diving and let’s face it, even those with money to spend are saying what the heck am I doing spending it on stuff I do not need.Wall Street is a big mess with all the Washington hoopla and talented people are jumping ship to smaller boats left right and cente ASAP to try to get out from under the microscope, and that is a good thing. It is interesting being in London and reading the local paper. Europe is a mess. I am sure you read that the Czech government was unseated, and their is much unrest going in to the G20 meeting next week. Much of France is on strike and Germany seems the only country that is talking about fiscal discipline. Over to CHINA I was struck by the call by the Finance dude to create an international reserve currency. It does make a lot of sense but can it happen quickly? There was an ad in the FT by some think tank saying that should be an outcome of the meetings next week. I think it is a very good idea but can it happen??? So much uncertainty. So much change. So much up in the air. So many wildcards. I am praying for a good outcome. Praying hard. 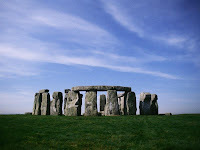 Speaking of prayer, just a few hours ago I was standing in the chilly wind looking at Stonehenge. One cannot imagine how these massive stones, originating from Whales, could possibly end up there, in that form. This all happened 5000 years ago. I stood there, with my 11 year old sitting on the ground sketching what he saw from 3 different perspectives, and I prayed. I prayed for the leaders of our nations to have solutions. I prayed for people to band together, help eachother, and support GOOD decision making and appropriately protest bad ones. I prayed for people that I know are hurting. I prayed for the world. Geithner appeared before the House Financial Services Committee today – here is a good summary of what he said. Also my fav thinker from ML, David Rosenberg, is leaving ML and moving to the buy side. I will greatly miss his thinking but I wish him and his family the best.